As hard as you try, sadly the anti-Muslim rhetoric from GOP Presidential candidates just won’t die down, with Ben Carson now joining the road filled with racist language, a tactic pioneered in this case by Trump. I joined CNN on Sunday to give my thoughts on the entertainment of politics or the politics of entertainment as I refer to this current show put on by the likes of Trump and Carson. Will it get these political players the nomination from their base to play up race and religion? I have more faith in America, and you should, too. 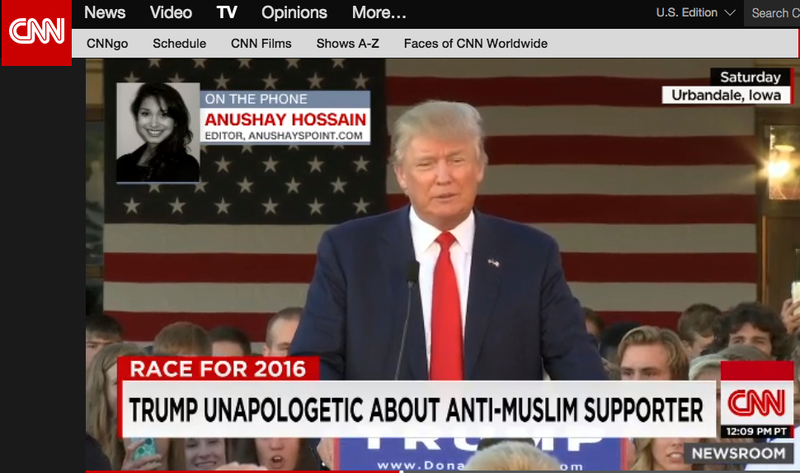 You can watch my full CNN interview here. Anushay, I worked first hand with Sunni and Shia Muslims in Iraq, educated individuals. They understand what fanatical Islamists in their country and around the world have done. Remember the celebration of many American Muslims when the 911 attack occurred? There is a very real problem. A Muslim problem. An American problem and a world problem. Whether or not Muslims and others want to admit it, Islam is going through a historical time of fanaticism. In some ways like the Catholicism of the 14th and 15th centuries. To deny this is irresponsible. To say it is politically incorrect or irresponsible to meet it head on is reckless and dangerous to you, me and everyone else who loves peace and freedom. Do I know Muslims that are good and kind? yes. Do I believe they understand their Islam to be loving and peaceful? Yes. Do we also not see the mass numbers of murders in the world being carried out in the name of Islam, especially in Islamic countries? We should. It is in the news media almost every day. So, let’s not pretend there is not a crisis in the form of Islam that has become very dangerous to Muslims and all others. I think Jeff is missing the point being raised here. It isn’t about the issues within Islamic countries and cultures – real though they are – but about political figures such as Trump et al spouting anti-Muslim rhetoric. That is a very different issue indeed! In my opinion this not anti-Muslim rhetoric. If I were Muslim, I would volunteer to be on a data base in order to keep our country safe. In fact, I agree not only with Trump, but more so, now with Carson, who has suggested that we, in America, should have a data base on everyone. This is for our safety. It is not meant to be anti-Muslim or anti-any faith or ethnic group. We Americans, all Americans, need to be proactive in guarding and ensuring the safety of our country. Karin, I wonder how you would feel if, instead of muslims, Trump and Carson start spewing hate against women.